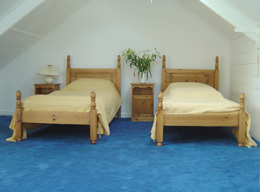 Self catering cottage Daymer Bay, Trebetherick, North Cornwall. 'Scenic walks, wild blackberries, rolling in the surf and basking in the sun. This has been a beautiful late summer break. Bars House has done us proud once more! Many thanks. Beautifully positioned family house three quarters the way down the pretty Daymer Lane. There is a pretty sheltered tiered garden, which is a real sun spot as it is very sheltered. The front of the house has a patio area with BBQ area, ideal for sunbathing and dining alfresco. Beautifully positioned family house three quarters the way down the pretty Daymer Lane. It is a 3 minute walk to the beach and surrounding cliffs. The renouned St Enodoc golf course is within easy walking distance. Daymer Bay itself is a lovely sheltered family beach with a great stretch of flat sand, and also sheltered inlets with rock pools around the cliffs. It is a fantastic spot for swimming and windsurfing. Across the estuary is Padstow (you can catch a ferry there from Rock) which is a lovely traditional working fishing village with superb fish restaurants and boutique shops. There is also a great cycling track running all the way along the estuary to Wadebridge. Rock is about a fifteen minute walk away and is a great waterside village superb for watersports and with some nice restaurants. Nearby and the quanit villages of .. with great pubs / restaurants. 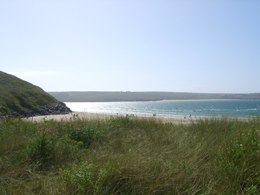 Polzeath is a three minute drive away which is agreat family beach with good waves for surfing.